In July of 1881, many Mexican smugglers were killed in what was called the First Skeleton Canyon Massacre. 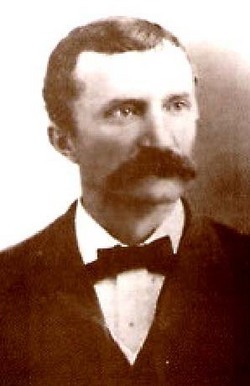 Fin’s father, “Old Man” Clanton, was said to be part of the group committing the murders. One month later while driving a herd of cattle through Guadalupe Canyon near the Mexican border, “Old Man” Clanton and several other were ambushed and killed by Mexican Rurales. 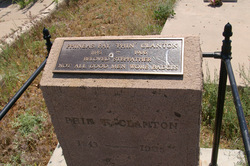 His body, along with the others, was buried near Cloverdale, New Mexico. Later that year on October 26th, Fin lost his younger brother Billy when he was killed during the gunfight at the O.K. Corral. His brother Ike was able to escape unharmed. A year later, Fin and Ike had their father’s bones dug up and buried at the Boot Hill Cemetery in Tombstone next to Billy. Fin spent years afterwards running amuck and suspected of cattle rustling with his brother Ike. In 1886, Fin was accused of grand larceny with 15 indictments against him. On September 1887, he was found guilty and sentenced to 10 years in the Yuma Arizona State Prison. He only spent one year and five months in prison before being pardoned by the governor. Afterwards, he moved to Globe, Arizona with his buddy Pete Spence and had an Angora goat farm. Trouble always seemed to follow Fin. He was arrested and accused of stealing jewelry but was found innocent of the crime. On October 15, 1902, at the age of 58, Fin married his love Laura Jane Bound. She was 44 and had a 12 year old son from her first marriage. Four years later on January 5th, Fin was in a wagon accident and out in the cold weather for a long period of time. He became ill and died at the age of 61 to a bad case of pneumonia. Laura married Fin’s friend and business partner Pete Spence four years after his death. Never knew of him, Ike and Billy were the better known or more infamous, thanks for that. Definitely lesser known, but no less troublesome. I have never heard of Fin, but his story is still interesting. Angry Lurker, Sis & Jessica, I am fastinated by the Clanton family and other outlaws. Fin may not have been as well known as his brothers but he had his share of troubles. His story is just as fascinating to me. I am hoping to meet current Clanton family members today and hear their stories of their Clanton descendants.